What would you say if someone asked you for your favourite Japanese restaurant? If you don't have one, check out Haru Haru Japanese Restaurant! This three-month old restaurant is truly a hidden gem in the north— it serves extremely fresh japanese cuisine that is worth visiting over and over again. Read till the end of the post to find out about Haru Haru's ongoing promotion! My partner doesn't fancy Japanese cuisine, but the restaurant has left a positive impression upon him because the food is really good (almost as good as the popular japanese restaurants that I love to go to). We started our meal with the Negima Mushi (S$15). It came as a surprise to me because it's actually seafood soup in a chawanmushi cup! I was in awe of the thick slices of boiled Otoro (Tuna belly). During the tasting, we learned that the Negima Mushi is not on their menu yet! Perhaps you can make a special request by telling the wait staff that you would love to try this! Next, we had the Wagyu Tataki (S$26.80) — a dish that disappeared in a flash because it was so soft and chewy! The Sukiyaki Wagyu (S$25.80) gives a unique sweet-savory taste of contrasting ingredients. In the traditional Sukiyaki, you have to put in your ingredients one-by-one with chopsticks. However, Haru Haru made things easier for us by having some of the vegetables cooked halfway, and we only had to put in the beef and raw egg after that. If there's only one thing you must try, it is this Yuzu Tebasaki (S$6.80)! It may sound farfetched but this is the best chicken wings I have eaten in 2015. It may look awful, but the yuzu flavour enhanced the natural sweetness of the chicken juices. It's extremely tender, and I think I can replace an entire KFC meal for this. The Haru Roll (S$14.80) is their signature, though it largely reminds me of the famous californian roll you see in sushi shops. However, they took a step further by adding Aburi Cheese salmon on top of the Crabmeat, Omelette & cucumber roll. Of course, salmon roe makes the sushi much more flavourful! 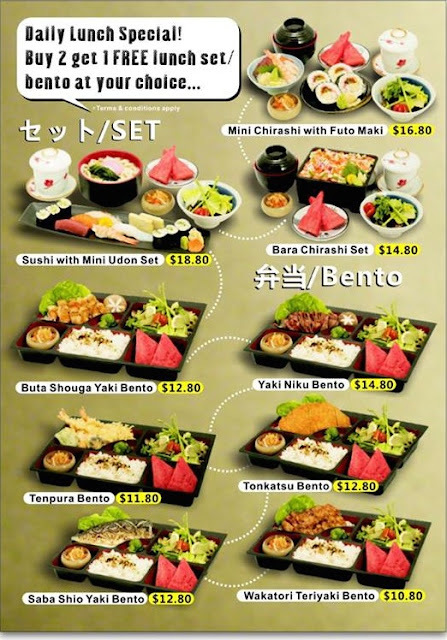 Don't miss the Zaku Ramen (S$14.80) and the Wagyu Don (S$24.80). The former is a hot piping bowl of ramen with succulent collagen-rich pork belly. Personally, I prefer the Pan-fried Wagyu Beef on Rice served with Miso Soup! The beef spots a red chunky mid part, yet it is not bloody. In fact, it is extremely soft and chewy — absolutely tantalising! If you're a family of raw fish lovers, then the Sashimi Mix (S$120) is all you need to order. It's a gorgeous platter that was enough to serve all eight of us... though I think the portion is usually for 6-8 pax! The Sashimi Mix comes with the Itoyori (Golden Thread) (S$38), the obvious-looking fish with golden lining on its tail in the picture. You also have to option to get the fish individually! The Chirashi Don Premium (S$31.80) is a gorgeous assortment of raw fish. Although the slices have thick yet uneven cuts, the main feature is to boast how fresh their fish is! The Aburi Sushi (S$23.80) consists of a salmon mendaki, swordfish, spicy tuna, squid, mermaid (prawn) and scallop (Hotate). I think the 6-pc sushi on a plate is purposely arranged for us to start with a neutral ocean-like flavour and ending with a smoky note.